Sun., May 29, 2011, 6:57 a.m. Restrictions: No motorized equipment or mountain bikes. Horses and dogs allowed, but party size limited to 12 beating hearts. Directions: Travel north from Wenatchee on US 97A for 38 miles to the Lake Chelan Boat Co. in Chelan, about 1 mile west of the city center. Or drive to Field's Point Landing about 17 miles northwest of Chelan via State Route 971 and South Lakeshore Road. Take Lady of the Lake to Stehekin. Disembark at Stehekin Landing and walk 0.25 mile to the North Cascades National Park Golden West Visitor Center. The trail begins just to the right of the center (elev. 1,150 feet). Or, take the Lady of the Lake to Prince Creek and end your hike at Stehekin. Fees: Hikers don’t need to permits, although if you’re attracted to the boat dock camping sites, a federal dock site permit is required at Prince Creek, Moore Point, Stehekin Landing and other docks along this trail ($5 per day or $40 for a season pass). Lake Chelan Boat Co. passenger ferries round-trip fares range from $39-$59. The Chelan Lakeshore Trail is a classic Northwest early- season backpacking trip, brightened by wildflowers before many ski areas are closed for the season. Many hikers revel in the unusual twist that they must board a ferry or hire a float plane to reach the trailhead. Lakeshore Trail 1247 usually is the first wilderness trail to open on the Wenatchee National Forest and North Cascades National Park. The route is mostly within either the Lake Chelan-Sawtooth Wilderness or the Lake Chelan National Recreation Area. It runs 18 miles along the north side of the 55-mile-long lake from Prince Creek to Stehekin at the west end of the lake just inside the national park boundary. The Lakeshore Trail crosses a number of small seasonal streams plus 11 significant creeks, some of which can be tricky to cross in spring flows. Later in the summer, backpackers can tramp up from the lake into Lake Chelan basin, past alpine lakes to the Methow Valley and the Washington Pass/Rainy Pass area on state Route 20. While that’s not a viable choice for another month or more, the Lakeshore Trail stays below the spring snowpack with at total elevation gain of only 500 feet. 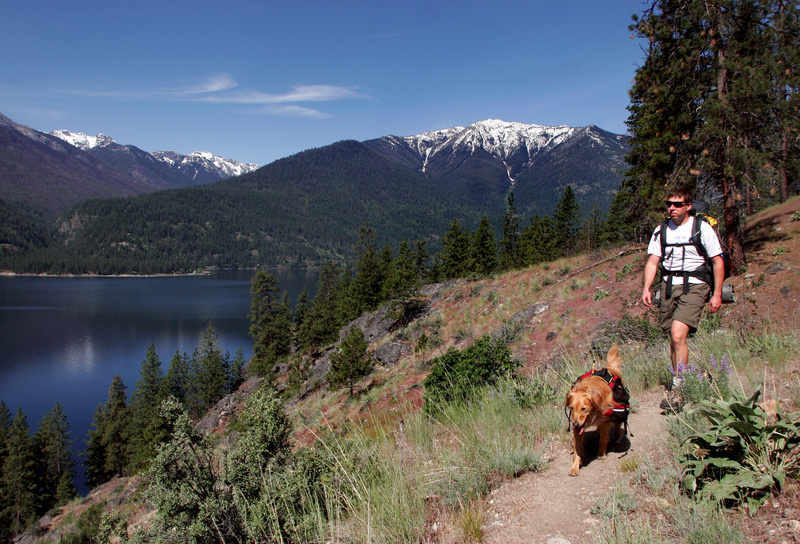 The Prince Creek trailhead is approximately 37 miles “up” Lake Chelan. The Stehekin trailhead is at the head of the lake 55 miles from Chelan. Note that between May 1 and Oct. 15, the ferry makes “flag” stops at Prince Creek. Before May 1 – and depending on the early-season lake levels – the only boat access is by way of Stehekin. From the Field’s Point Landing, take the Lady of the Lake ferry 20 miles to Prince Creek Campground. The ferry comes in landing-craft style, dropping a gangplank from the nose of the boat so passengers can disembark onto the steep rocky shore. Take time to check out the Prince Creek bar, which was leveled by heavy spring flooding in May 1948, eliminating use of a forest guard station and Boy Scout camp. From the Prince Creek drainage, the trail heads northwest up the lake. It’s common to see deer and black bears along Lake Chelan during spring, and it’s not uncommon to see a rattlesnake or to have to pluck off a few ticks. For an easy first day, Everett Herald photographer Jennifer Buchanan and her party started at Prince Creek and stopped for the night near the Meadow Creek shelter. She found the site less than ideal, infested with mosquitoes and with no views of the lake. “Given the choice now, I would have pushed on to Moore Point for an established camp on the lake,” she said. Hiking from Meadow Creek to Moore Point was another short day for her group, allowing for an early-afternoon camp. “We made camp down near the lake and then took a short hike around the point,” Buchanan said. Hunt’s Bluff is a Moore Point-area destination popular with hikers seeking a lake overlook. “After having lunch, we took a chilly swim and chucked some sticks for Ana, the ever-fetching dog,” Buchanan said. Published: May 29, 2011, 6:57 a.m.